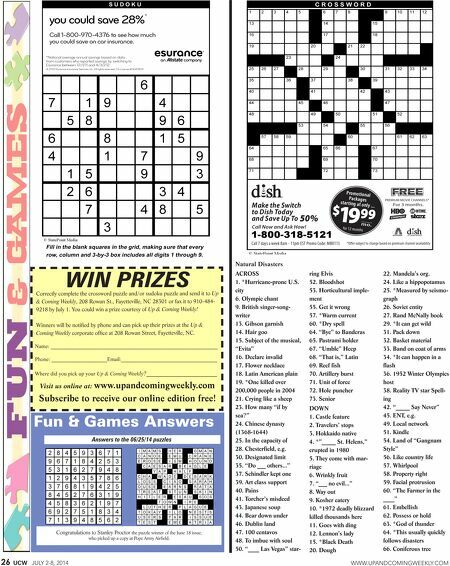 26 UCW JULY 2-8, 2014 WWW.UPANDCOMINGWEEKLY.COM WIN PRIZES Correctly complete the crossword puzzle and/or sudoku puzzle and send it to Up & Coming Weekly, 208 Rowan St., Fayetteville, NC 28301 or fax it to 910-484- 9218 by July 1. You could win a prize courtesy of Up & Coming Weekly! Winners will be notified by phone and can pick up their prizes at the Up & Coming Weekly corporate office at 208 Rowan Street, Fayetteville, NC. 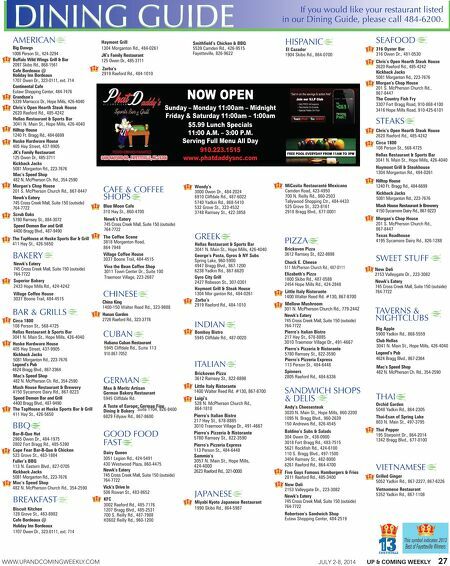 Name: __________________________________________________________________ Phone: ______________________Email:______________________________________ Where did you pick up your Up & Coming Weekly?_________________________ Visit us online at: www.upandcomingweekly.com Subscribe to receive our online edition free! Fun & Games Answers Answers to the 06/25/14 puzzles ACROSS 1. *Hurricane-prone U.S. city 6. Olympic chant 9. British singer-song- writer 13. Gibson garnish 14. Hair goo 15. Subject of the musical, "Evita" 16. Declare invalid 17. Flower necklace 18. Latin American plain 19. *One killed over 200,000 people in 2004 21. Crying like a sheep 23. How many "if by sea?" 24. Chinese dynasty (1368-1644) 25. In the capacity of 28. Chesterfield, e.g. 30. Designated limit 35. "Do ___ others..." 37. Schindler kept one 39. Art class support 40. Pains 41. Torcher's misdeed 43. Japanese soup 44. Bear down under 46. Dublin land 47. 100 centavos 48. To imbue with soul 50. "____ Las Vegas" star- ring Elvis 52. Bloodshot 53. Horticultural imple- ment 55. Get it wrong 57. *Warm current 60. *Dry spell 64. "Bye" to Banderas 65. Pastrami holder 67. "Umble" Heep 68. "That is," Latin 69. Reef fish 70. Artillery burst 71. Unit of force 72. Hole puncher 73. Senior DOWN 1. Castle feature 2. Travelers' stops 3. Hokkaido native 4. *"_____ St. Helens," erupted in 1980 5. They come with mar- riage 6. Wrinkly fruit 7. "___ no evil..." 8. Way out 9. Kosher eatery 10. *1972 deadly blizzard killed thousands here 11. Goes with ding 12. Lennon's lady 15. *Black Death 20. Dough 22. Mandela's org. 24. Like a hippopotamus 25. *Measured by seismo- graph 26. Soviet entity 27. Rand McNally book 29. *It can get wild 31. Pack down 32. Basket material 33. Band on coat of arms 34. *It can happen in a flash 36. 1952 Winter Olympics host 38. Reality TV star Spell- ing 42. "_____ Say Never" 45. ENT, e.g. 49. Local network 51. Kindle 54. Land of "Gangnam Style" 56. Like country life 57. Whirlpool 58. Property right 59. Facial protrusion 60. "The Farmer in the ____" 61. Embellish 62. Possess or hold 63. *God of thunder 64. *This usually quickly follows disasters 66. Coniferous tree Natural Disasters Congratulations to Stanley Proctor the puzzle winner of the June 18 issue, who picked up a copy at Pope Army Airfield.